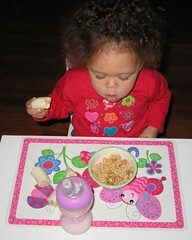 We recently got some new furniture for Cupcake -- a little toddler table and chair, so she can draw, read, etc. An unintended benefit is that we can reinforce the self-feeding that they do at school. Now, we just put the food in front of her, and she dives right in and feeds herself.